In less than a week, Microsoft flighted another preview build of Windows 10 Creators Update to Windows Insiders on the Fast ring, for both Windows 10 for PC and Windows 10 for Mobile (for Mobile edition, it’s the first release after weeks without new release). The Windows 10 Build 15007 was released on January 12th, 2017, and similar to Windows 10 Build 15002 that was released days earlier, it packs lots of new features and enhancements. Windows 10 Creators Update is said to be feature-locked by end of January, and that probably explained the flurry of new features added in recent builds before Microsoft focuses on fixing bugs. One of the major feature appeared in Windows 10 Build 15007 is Game Mode, though it may only be fully working in future builds. 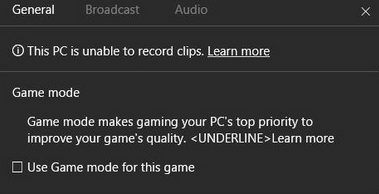 According to Xbox Wire, Game Mode that is to introduce with Windows 10 Creators Update will optimize Windows 10 PC for increased performance in gaming, and it’s available for both Windows Store UWP games and Win32 desktop games. The Game Mode settings appear in the Game DVR panel which could be accessed by pressing Win + G keyboard shortcut. You can download and install Windows 10 Build 15007 via Windows Update. Sharing your tabs (PC): Just click the “Tabs you’ve set aside” button, and under the “…” menu select the option to “Share tabs” with many apps installed on your PC. 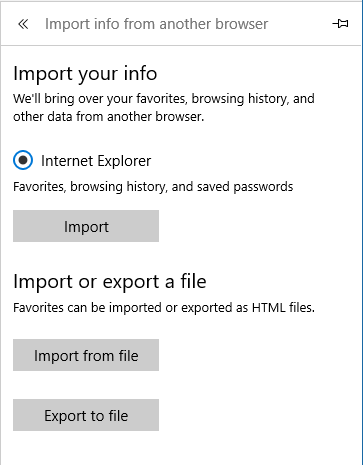 Import data (PC): New “Import from another browser” button in Settings allows you to bring your favorites, browsing history, saved passwords, and other data from another browser you have installed, in one simple step. Web Notes improvements (PC): Tap the pen or highlighter in Web Notes, and you will now see the full set of Windows Ink colors, as well as the new slider released for Windows Ink with Build 14986. Text scaling and zoom (Mobile): Zoom into a webpage regardless of zoom settings defined by the website, matching other mobile browsers. Pages are now zoomable to at least 500%. Download themes for your PC from the Windows Store (PC): Store page for themes. Cortana can help you pick up where you left off (PC): When you switch computers, Cortana will display quick links in the Action Center to help you easily get back into the Microsoft Edge websites and SharePoint (or other cloud-based) documents you used most recently. Inline progress bar for notifications (PC): App developers can now send toast notifications with a progress indicator to show progress to the user, such as download progress, exercise progress, etc. Scrollbar improvements for UWP (PC & Mobile): The panning indicator now appears when you move a mouse over a scrolling region and the full scrollbar appears when you want to directly interact with it. Windows Hello Enrollment Improvements (PC): For devices and peripherals that support Windows Hello. you’ll now see a visual guidance that tracks your face in real-time, shows you an improved progress indicator and gives you real-time feedback to quickly and smoothly set your face up for signing in. You can setup or improve your Windows Hello facial recognition under Settings > Accounts > Sign-in options > Windows Hello > Face recognition. New Bluetooth APIs (PC & Mobile): New APIs that enable GATT Server, Bluetooth LE Peripheral role and unpaired Bluetooth LE device connectivity. App reset (Mobile): If you have a UWP app in a bad state, open Settings > System > Storage, and navigate to the app. In the advanced settings for that app, you’ll now see a “Reset” option. Tapping it will clear the app’s cache, and reset the app as if it had just been installed (without actually having to reinstall it). Cortana loves music (Mobile): Use Cortana to control music playback on more of your favorite music apps (EN-US only). While you are listening to music in one of these apps, you can also use your voice to control playback and volume. With radio stations, supports “Hey Cortana, What’s Playing”. Adding music recognition support to Chinese (Simplified) (Mobile): Cortana can now recognize music for customers in China. Cortana sign-in using Azure Active Directory (AAD) identity (Mobile): This capability will allow you to sign into Cortana with your work or school account instead your MSA, enabling you to use Cortana even if your organization does not support MSA. More recurrence options for Cortana Reminders (Mobile): New option to set recurring time-based Cortana Reminders for “Every Month” or “Every Year”. Web payments (Mobile): New Payment Request API, which allows sites to make checkout easier using the payment and shipping preferences stored in your Microsoft Wallet. Improved legibility for UWP apps in high contrast (Mobile): Updated the XAML framework to now display an opaque layer behind the text and coerce semi-transparent UI to be fully opaque. Moved app related settings out of System into a new category called Apps. Updated device settings (Mobile): The new device settings experience combines the Bluetooth and Connected devices pages to offer a single place to manage your devices/peripherals. New option to pause updates (Mobile): Pause updates on your phone for up to 35 days. To pause your phone, go to the Settings > Update & security > Phone Update and tap Advanced. Encrypt your SD card (Mobile): Encrypt SD cards that have been inserted into the phone when device encryption is enabled. Glance Screen Improvements (Mobile): The “Always show Glance screen when charging” option is available in Settings under Personalization -> Glance Screen. Windows 10 Creators Update is expected to be released in the 2nd quarter of 2017.